WITH INTERSTATE, FEDERAL AND STATE HIGHWAYS, EXIT NUMBERS, MAJOR ROADS, CITIES, TOWNS, LAKES, RIVERS, PARKS, COUNTY NAMES BOUNDARIES & MORE, EVEN INCLUDING NAMED MAJOR STREETS and COUNTY ROADS! Local publication created by A Maps & Graphics, and quite possibly the most detailed large commercial map ever made for State of Georgia. 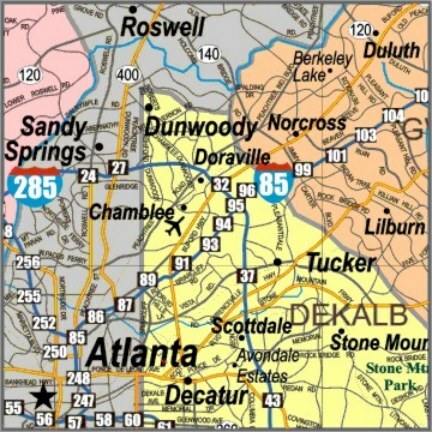 We've been publishing business maps in Atlanta area for over for over 25 years. Ideal for all business mapping applications including marketing, distribution & delivery routes, franchise & sales territories, property location, service accounts & general reference. Includes the new highway exits, all state, federal and interstate highways, small towns, major parks, lakes, rivers, airports and more! 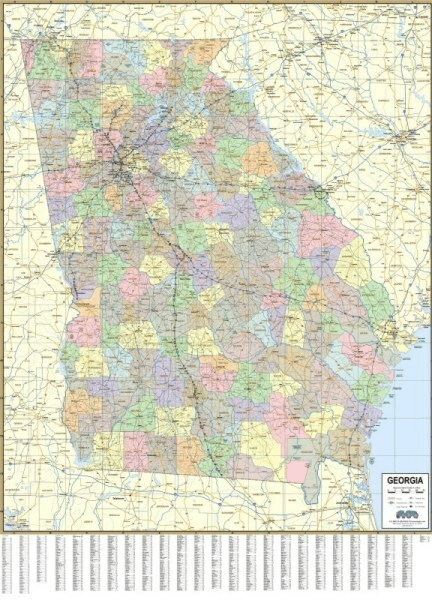 Laminated 2 sides, can even be mounted to foam board and framed...(must print 48" wide to mount) even includes the major highways, cities and counties in the surrounding states adjoining areas -showing Greenville/Spartanburg, Columbia, Charlotte, Chattanooga, Jacksonville, Tallahassee, Dothan, Panama City areas.